Plants vs. Zombies: Garden Warfare came out near the end of February with pretty much no hype or fanfare. I’m not entirely sure if it was really marketed at all. It was actually several weeks later that I noticed it had indeed come out, initially on Xbox One and 360 only, and that’s when I started paying attention. After watching several videos and streams I just knew it was something I would enjoy, and I was totally right. 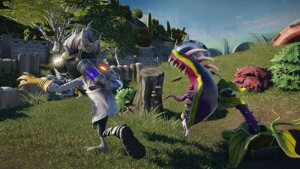 The game is a third-person shooter with the Plants vs. Zombies theme. Garden Warfare is essentially multiplayer only but you could play split-screen offline if you really wanted to. 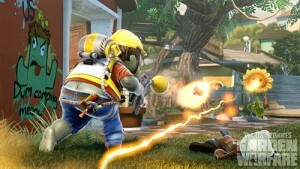 There are several modes including a horde-style defense mode where four plants defend their garden from waves of AI zombies, your regular TDM mode where you have to get 50 kills, Gardens & Graveyards where zombies are trying to push through 6-7 gardens to complete their objective while the Plants defend, and a newly added Gnome Bomb mode where each side has pickup the gnome and use it to blow up three objectives. Gardens & Graveyards is easily my favorite but I do enjoy all of the versus modes. The horde-style defense mode, the name of which escapes me right now, is one that I haven’t quite put a lot of time into. Mainly because it’s the kind of thing that requires good communication and a certain level of competency that I have yet to find. Edit: Oh, and the player count for some of these modes goes up to 24. Eat your heart out, Titanfall. Each side has four character classes that each get three abilities; all of which now have a new variant thanks to recent DLC. Each character also has several variant types that can be unlocked and they almost completely change how the character handles. Peashooter – Pretty much the regular soldier type. He shoots peas out that deal splash damage and he can toss a chili beam bomb to seriously wreck your day. 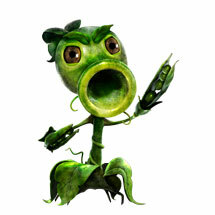 The Peashooter can also embed himself in the ground for a rapid-fire attack or zoom around and jump high with his sprint ability. Some of his variants include an ice, fire, and poison version. Chomper – This guy is a little trickier to play because he is melee only. He can take you down if he chomps on you or swallow you whole if he gets you from behind. To help him out he can also burrow underground and popup beneath unsuspecting dudes for an insta-kill. The tradeoff is he has to spend time digesting which slows him down and prevents attacking. The Chomper also gets a spikeweed that yanks zombies up in a snare along with a goo attack that seriously slows and prevents the use of special abilities. I haven’t unlocked any of his variants yet but from what I’ve seen there are Chompers that can actually breathe fire and other cool stuff. Sunflower – She is the plants’ healer and has the lowest HP. She can still attack decently though and also gets a pretty good sunbeam attack but it requires you to root yourself in the ground. To help heal the team Sunflower has a healing tether that you can attach to a single ally along with a potted sunflower which will drop healing sunlight orbs every so often. I don’t have a lot of experience with Sunflower variants but from what I’ve seen from others it seems like some may be a little beefier and even have better offensive attacks. Foot Soldier – The basic infantry unit that does very well with mid to long range combat. The Zombies don’t seem to have a specific sniper unit but this guy seems to fill this role rather well, especially with some of his variants that actually seem to have sniper rifles. The Foot Soldier gets a rocket boost jump so he can get to higher ground for good positioning. He also gets a damaging smoke grenade which is great for use when taking gardens as well as a power ZPG rocket that can take out almost anything with a direct hit. Engineer – One of my overall favorite characters. This goofy-looking dude can zoom around on a jackhammer to cover ground fast and it doubles as a defense against burrowing Chompers. He also gets a nifty stun genade and a flying drone similar to the Cactus. Engineers are very important for Garden & Graveyards because they can also build up the teleporters that lie halfway between each new garden which helps the Zombies more easily overrun the Plants. Engineers can also build up turrets in specific places around the teleporter to help defend them. Scientist – This dude is the healer for the Zombie team. His main attack is pretty nice and long range but he can easily mess people up face-to-face with some of his variants. The Marine-biologist, for example, has a pretty powerful porpoise shotgun. To better help his team he gets a little healing device he can drop which heals everybody nearby. The Scientist also gets a sticky grenade and a teleport ability which make him very offensive capable. 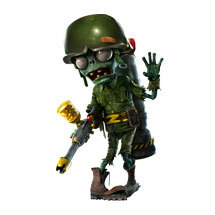 All-Star – This is the toughest zombie on the team. He gets minigun style weapon and the variants do things like shoot ice or splash damage. He can drop down big tackle-dummies to block enemy fire and keep plants out of the garden he is attacking. To further up his offensive he can punt forward a little explosive imp or rush forward with a powerful tackle move. In order to unlock new stuff or to get consumables you need to open card packs of varying price. You earn coins for playing the game, scoring well, etc. Packs are as low as 1000 coins and contain things like potted plants for defensive planting, summon-able zombie NPCs, and consumable items for the horde mode. The more expensive packs will sometimes have character customizations, character and weapon upgrades along with the occasional character sticker which is required for unlocking variants. The most expensive pack is 40k coins and it will pretty much straight up unlock a new variant. I usually go for the 20k pack since it seems to have the best spread of upgrades, stickers, aesthetic items, and consumables. With the things you find in the packs you can deck out your character with various items. There are four customization slots and they vary depending the the class and team but they offer you several different types of ways to customize your character. Your engineer can have a toilet on his back, your sunflower might have a clown face, etc. My engineer has a traffic cone on his head and my cactus ans a gladiator helmet and lawn gnomes for arms. There are also additional taunts and animations you can unlock and assign to the d-pad. You also go up in rank by ranking up characters. You will be given three different objectives at once for each character and when you complete one it will award you a star. Each level takes a certain number of stars to progress to the next. Starting at level five or so you will start to get a bonus card pack every time that class gains a level. The pack will have a few customization options and sometimes even a character variant sticker. I’m not entirely sure but I believe that your own rank goes up each time one of your classes ranks up. I’m at 41 or something now but I’m not entirely sure if that is anything other than bragging rights. It is starting to get a lot harder to rank up, though. Some of these challenges are difficult and finding challenge skips in the card packs can be rough. Very surprisingly there seems to be ZERO MICROTRANSACTIONS. Or if there is I can’t find any option to “buy coins” or anything. Even the recent DLC was free and it was very substantial; it added three variant abilities for each class along with the new gnome bomb mode and at least one new map. It’s really weird because I can easily see this game being free-to-play but having microtransactions for buying coins and such. Yet oddly enough it’s only $40 (For the Xbox One version) and there are no MT’s and the DLC is free? It’s like bizarro world over here or somethin’. I’m just completely in love with this game and I haven’t really touched anything else in days. There hasn’t been a shooter that has drawn me in so much in a very long time. I think it might have been Battlefield 1942 actually. Titanfall is fun and all but it doesn’t really hold a candle to Garden Warfare. In my mind anyway. Hopefully more people will give it a shot and they wont be turned off by the fun, cutesy aesthetic. Personally, I love it, but some people aren’t secure enough to play anything that isn’t “mature” or doesn’t spew blood all over the place. The PC release is coming up soon and I urge EVERYBODY to buy the game and play it. I will definitely be there. This game was definitely high on my watch list before, now I’m definitely going to have to grab it. I’m anxiously awaiting the PC launch. Graev has been playing a ton of the Xbox One version and I want to hop in and play! Playing it on xbox 360 and it is indeed fun. Colourful, original and no stress somehow. People thus far seem to be mellow. I’ve avoided buying anything on Origin since Sim City, but this is definitely going to make me crack. Me and the wife were addicted to the Mass Effect 3 multiplayer and the co-op here looks too good to pass up. @Jenks: There isn’t split-screen multiplayer. There’s only split-screen local co-op against waves of enemies and the 2nd player can’t earn anything. Garden Warfare sounds like a good game to try for spring now that I’m back to some landscaping work. A bit of irony. Great write up for a great game. I bought it for 360 and X1 (to play with all friends) and I must say I didn’t think it could look better than the 360 version, until I played it on X1. Just amazing. I do want to spend more time playing it, but SMITE came out and it’s sucking up my life. But I agree, really enjoyed this game a lot more than TitanFall!